A pair of images of a young star, made 18 years apart, has revealed a dramatic difference that is providing astronomers with a unique, "real-time" look at how massive stars develop in the earliest stages of their formation. The astronomers used the National Science Foundation's Karl G. Jansky Very Large Array (VLA) to study a massive young star called W75N(B)-VLA 2, some 4200 light-years from Earth. They compared an image made in 2014 with an earlier VLA image from 1996. "The comparison is remarkable," said Carlos Carrasco-Gonzalez of the Center of Radioastronomy and Astrophysics of the National Autonomous University of Mexico, leader of the research team. The 1996 image shows a compact region of a hot, ionized wind ejected from the young star. The 2014 image shows that ejected wind deformed into an distinctly elongated outflow. "We're seeing this dramatic change in real time, so this object is providing us an exciting opportunity to watch over the next few years as a very young star goes through the early stages of its formation," Carrasco-Gonzalez said. The scientists believe the young star is forming in a dense, gaseous environment, and is surrounded by a doughnut-shaped, dusty torus. The star has episodes in which it ejects a hot, ionized wind for several years. At first, that wind can expand in all directions, and so forms a spherical shell around the star. Later, the wind hits the dusty torus, which slows it. Wind expanding outward along the poles of the torus, where there is less resistance, moves more quickly, resulting in an elongated shape for the outflow. "In the span of only 18 years, we've seen exactly what we predicted," Carrasco-Gonzalez said. There are theoretical models developed to explain why nearly-spherical expansion of such outflows had been seen with young stars much more massive than the Sun, when narrower, beam-like outflows were expected based on observations of less-massive, Sun-like stars at similar stages of development. W75N(B)-VLA 2 is estimated to be about 8 times more massive than the Sun. 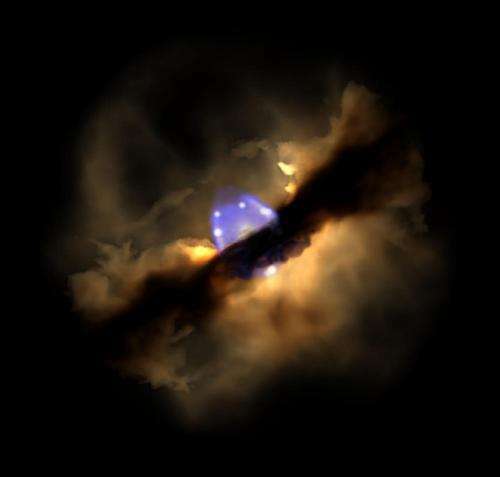 The more-uniform outflows are seen in massive young stars in the first few thousand years of their lives, the stage at which W75N(B)-VLA 2 is thought to be. 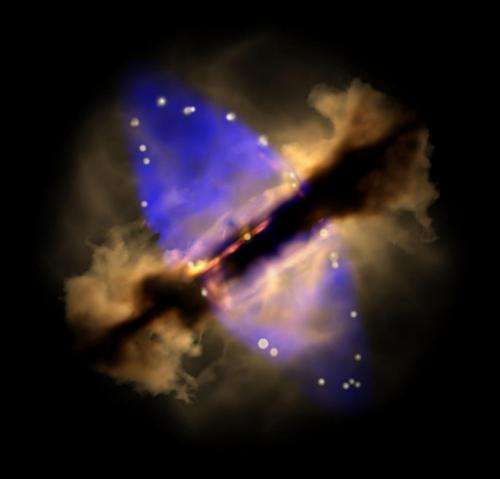 "Our understanding of how massive young stars develop is much less complete than our understanding of how Sun-like stars develop," Carrasco-Gonzalez said. "It's going to be really great to be able to watch one as it changes. We expect to learn a lot from this object," he added. Can any say "electromagnetic fields" ? These are clearly the driving force for star formation as anyone with common sense can see from these photos. it's about time to start paying more attention to the plasma physicists and electrical engineering cosmologists that have been saying this all along. The Primer Fields explains these observations perfectly as does Donald Scott in his 2009 presentation to NASA at the Goddard Colloquia on Engineering. Can anyone say "another comment by a deliberately ignorant EU troll"?